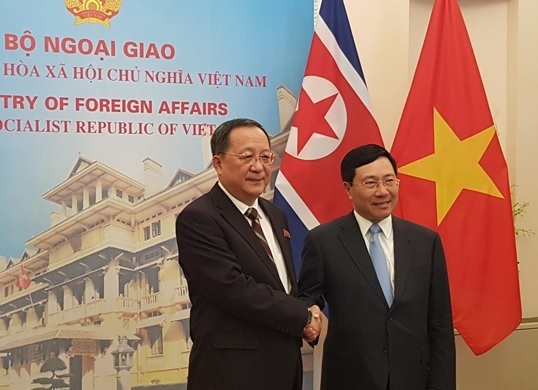 North Korean Foreign Minister Ri Yong-ho has discussed bilateral ties with top Vietnamese officials during his trip to the Southeast Asian country, the North's state media said Monday. Ri met Vietnamese Prime Minister Nguyen Xuan Phuc and Deputy Prime Minister Pham Binh Minh during his trip there, according to the Korean Central News Agency. "Both sides had an in-depth exchange of views and reached consensus on the issue of further developing the relations of friendship and cooperation between the two countries," the KCNA said in English. It did not provide more details on what they discussed during the meetings. Local media earlier reported that Ri and the prime minister exchanged views on Vietnam's reform policy, better known as "Doi Moi." During his stay there, the KCNA reported that Ri also visited the mausoleum of late Vietnamese President Ho Chi Minh and toured the Academy of Agricultural Sciences in Halong Bay.